Multidiscipline treatments to restore a missing tooth. Patient has orthodontic treatment by Dr Nguyen at Georgia Orthodontic Care to close spaces and setup ideal space for missing tooth. It then restored by Dr. Vo using state of the art implant technology. Another implant and cosmetic restoration were completed at our office. Patient was missing a lateral incisor. Other upper anterior teeth had old fillings and defective crowns with open margins. This problem made patient’s gum very unhealthy. 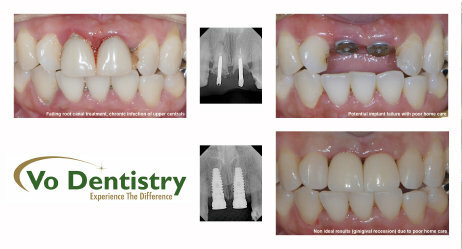 A dental implant was placed and implant crown was used to replace the missing tooth. Other anterior teeth were restored with full ceramic crowns. Patient is very happy with her new beautiful and healthier smile. Another implant case is completed by Dr Vo. #19 had root canal treatment failure. It was extracted and an implant was immediately placed into the extraction site. After the implant has healed, it becomes "integrated" into the jaw. Then a crown is placed on the implant. Patient has history of poor home care, upper central incisors have failed root canal treatments and restoratives, severe chronic infection. We extracted both incisors, immediate implants were placed. Due to patient's poor home care, the results are not ideal (gingival recessions, black triangle) as our standards. However, patient is very happy to have her smile back.